But whether or not there indeed was such an attempt, the Soviets are certain to try sending a rocket to the moon, and soon, too. The moon is very much the Reds’ next target. Moscow has laid its plans, and will surely make an effort to carry them out. At first it will be an unmanned rocket; in fact, several of them. Later the Soviet rockets to the moon will be manned. Finally, Soviet men will stay on the moon, either for definite periods of time or permanently. Such is the Kremlin’s announced agenda. The Russians say they will build special lunar cities with unique atmospheric pressures so arranged as to enable humans to survive and thrive on the moon. We have this on the authority of Prof. N. A. Varvarov, chairman of the Astronautics Section of DOSAAF, the initials standing for the Russian name of the Volunteer Organization of Aiding the Army, the Air Force, and the Navy of the Soviet Union, the civil-defense apparatus of that country. The Red city will be constructed in one of the lunar craters, under a tremendous dome of glass and furnished with aluminum doors which Prof. Varvarov calls “air-locks.” Inside, at every half-mile or so, the city will be partitioned by glass walls with double doors. These will minimize the damage that may result from falling meteorites or other accidents. The walls will play a role similar to that now served by an ocean-liner’s water-tight compartments. A number of solar- and atomic-energy stations will be built on the moon by the Soviet man of the future. With the aid of these, the moon’s light, water, and other necessities will be provided. Aluminum, glass, plastics, oxygen, and nitrogen will all come from lunar ores. Soviet men, exploring the moon, exploiting its natural resources, and building those lunar cities, are shown in the recently completed Moscow film, Road Into Interstellar Space. This movie was produced with the help of a large group of Soviet scientists specializing in astrophysics and astronautics. Prof. Varvarov must have been among these advisers. The main industry of the future Red lunar settlements, as envisaged by Varvarov in his writings, will be the manufacture of spaceships and spaceship fuel. For after the moon, Mars and Venus will be the Soviet targets, with the moon serving as a way station and a ship-and-fuel depot en route to those planets. To cover the distance equal to that between the earth and the moon, a pedestrian would have to be in ceaseless motion for 8 years and 280 days; a bicyclistâ€”1 year, 168 days, and 8 hours; an automobileâ€”160 days; an express electrical trainâ€”53 days and 8 hours; and a late-model airplaneâ€” 20 days. Sputnik I has covered a similar distance in 13 hours and 43 minutes. A Soviet rocket to the moon, at some 25,000 miles per hour, can reach its destination in less than 10 hours. Even if a Red rocket cannot reach the moon for a while yet, it may be able to circle the moon and then return to any point of the Soviet part of our globe. This is the so-called Operation Boomerang, now being planned by Prof. G. Chebotarev of Moscow â€” a scheme of hurling a rocket to the moon and back, with a small initial fuel push to start it and no fuel expenditure en route. The initial push in launching this rocket will take only 16 tons of fuel, insists the Red scientist. He describes his rocket thusly: Shaped like an elongated ellipse, the rocket will contain a radio transmitter and movie-and-photo cameras, giving the Soviets valuable data of the lunar surface from a closer distance than ever before, and, most importantly, of that part of the moon (41 percent of it) which presently we cannot see. The rocket will come back like a boomerang, says Prof. Chebotarev; or, yet more correctly, “like a stone thrown upward.” Its speed will diminish “as in the stone when it as^ cends, until its speed is zero.” Dropping back to earth, the rocket will resume its former speed. To save the rocket from smashing on return, it will be equipped*with an automatic parachute set to open at a certain height on its way back to earth. Following Operation Boomerang, or launched simultaneously, there may be a Soviet rocket aimed to hit the moon rather than circle it. This may have a hydrogen warhead, meant to explode on striking the moon on a night when the latter is not visible to us. The explosion would then produce for us illumination stronger than ordinary moonlight even at the moon’s fullest. If achieved, this would be eloquent propagandistic proof of Soviet political and technological power, indeed. Of a more peaceful yet most practical value could be Red rockets landing on the moon with no explosions, but with instruments that would broadcast back to the Soviets important scientific data on the state of the moon’s affairs. 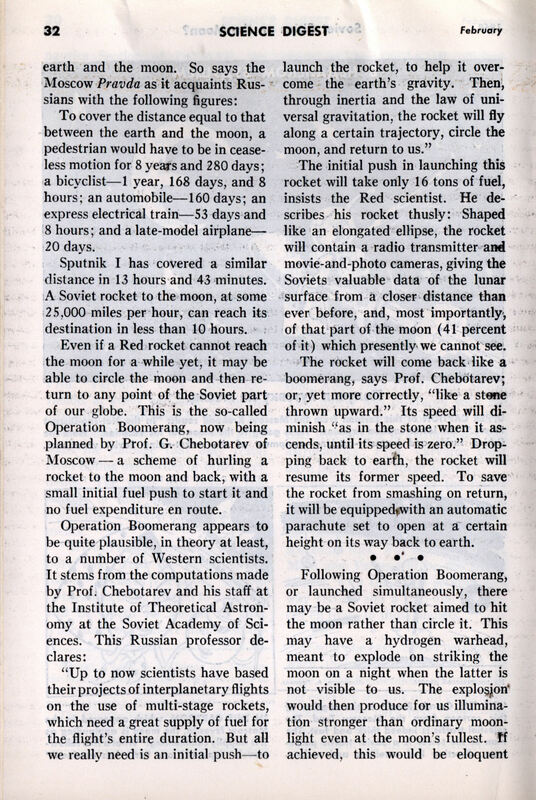 In the Moscow press these days, Yuri S. Khlebtsevich declares that such rockets would send back to Rusian scientists plentiful radio and television reports from the moon. He maintains that such a landing and such consequent broadcasts may be organized by the Soviets not later than the beginning of the next decade â€”in the early 1960’s. Khlebtsevich, who is chairman of the Soviet Technical Committee on Radio-Television Guidance of Rockets, describes such an unmanned rocket to the moon as “a tankette-laboratory,” which can be launched with no more than 250 tons of fuel. That it can reach the moon, he has no doubts. “Moving upon the moon’s surface,” explains Khlebtsevich, “the tankette will incessantly take films, relaying them to us as television.” It will probe the moon’s ground, register its temperature, and measure all sorts of phenomena out there. The future flight, landing, and functioning of this “tankette-laboratory” were graphically and effectively shown in the special Disney-like film recently released by the Soviets both at home and abroad. After these unmanned rockets will come manned ones. 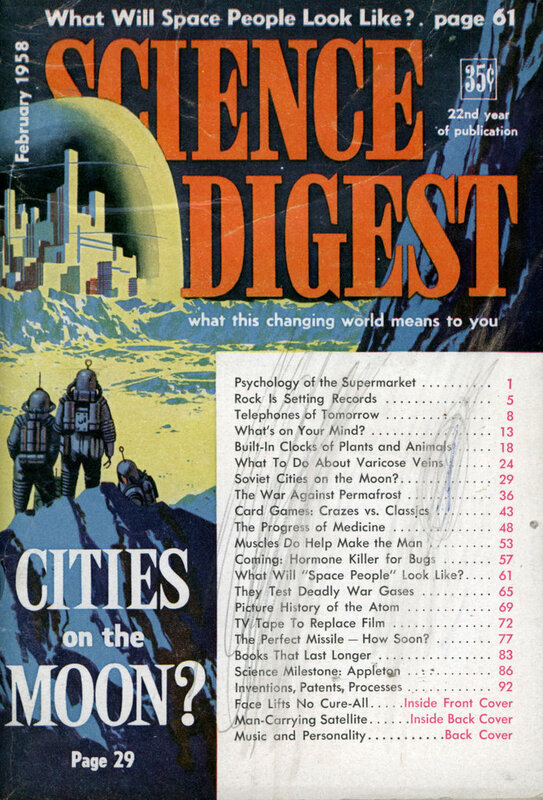 But will the Soviets have a legal title to the moon, and later to other heavenly bodies â€” if they are the first to reach those outer worlds? Landing alone is not enough, maintains Dr. Norman MacKenzie, president of the University of British Columbia, one of Canada’s leading experts in international law. “Possession and control” constitute the only formula, he states, under which any nation on earth can claim anything above us. But that is precisely Moscow’s plan: to possess and control anything the Reds reach in outer space. That is why they intend, as soon as they are able, to have human beings in those Soviet interplanetary rockets, and to establish permanent man-staffed Russian stations on the moon and further yet. Khlebtsevich professes to be disturbed by the fears recently expressed by some Americans that the Russians would appropriate and fortify the moon once their manned rockets reach it. He is echoed by Prof. Anatoly Blagonravov, head of the Technical Sciences Division of the Soviet Acad-emy of Sciences. This Red professor, who visited the United States last fall and happened to be attending a scientific conference in Washington when the news of Sputnik I astounded the world, also tries to dismiss such American misgivings. He writes that such fears are “an absurdity to any sober-thinking military expert in any country” who surely knows that “the hoisting of any national flag on the moon should not be the basic goal” of any astronauts, be they Soviet or American. A piquant fact, little advertised by Moscow, is that “Pacifist” Blagonravov is not only a professor but also a lieutenant-general in Soviet artillery, president of the Soviet Academy of Artillery Sciences, and author of a score of treatises on aviation arms. Both Khlebtsevich and Blagonravov protest that the future Soviet take-over of the moonâ€”and possibly also of Mars and Venusâ€”will in no wise serve purposes of war. “Bombing of any given point on the earth is always simpler and can be made more exact when done from the earth itself than from the moon and even more so than from Mars and Venus,” argues Khlebtsevich, and agrees Blagonravov. As if to guarantee this neutralization of the distant planets, both Khlebtsevich and ^Blagonravov suggest that America join Russia in all such peaceful rocket-researches and rocket-building, with both our brains and our dollars. A most idyllic picture is painted by the Moscow scientists as the inevitable result of this American-Russian pooling of resources. The thrifty among us may be tempted by Khlebtsevich’s claim that Soviet blueprints of these non-military rockets “will be far less expensive than American projects” of such flights. And, if we may be a wee bit cynical, why not? From the Soviet viewpoint, that isâ€”why not? In all such contacts amid our contests the Soviets would always learn more from our scientists than the Soviets would in their turn impart. At least, they would try to take as much as they could but give little, if anything at all. Actually, one of the early Skylab experiments showed that in a weightless or low gravity environment plants grow just as they do on earth. I love the illustration since it shows the Soviets as having built a church!